For many of the older generation, Gim Tim Restaurant should ring a bell. Being one of the pioneer Chinese restaurants in Singapore, it has served up decades of delicate, homely cuisines over the years. Against the changing markets, Gim Tim has rebranded itself for this new age. For soup lovers, you will love the Yu Piao Gen. This fish maw soup is loaded with delights - aplenty of fish maw and fresh and real shredded crabmeat. It may be a little starchy and thick for some but it suited our personal likings. He Zhou with Achar at Gim Tim is fried to crispy perfection. The fillings in the beancurd skin is not skimpy with fresh prawns with bits of crunchy water chestnuts (for those who worry) and you can savor it with the sweet honey sauce provided. The accompanied Achar is great - not too spicy, and has a great nutty flavor and crunch to it. The Home Made Bean Curd with Melon took us by surprise. Very smooth and soft, the bean curd is fried only crispy on the outside and silky within. It is topped with fresh, shredded crabmeat and crab roe, although i find that the crab roe was a tad too hard and rubbery in texture. Served along baby corns, mushrooms and snow peas, the Sea Cucumber Duck is one magnificent dish. The sea cucumber is soft and cooked to the optimum and it does not carry any distasteful smell to it. The duck is braised under slow heat for hours till it is so soft that it falls apart upon minimal contact. Another dish that was to our liking was the Kou Rou Bao. The bun was extremely soft and the pork belly was braised and very flavorful. The only thing i could have wished for was for the pork belly to be a little softer. A very special dessert at Gim Tim is the Young Coconut Pudding which resembles beancurd, except that the pudding has a coconut taste to it and is served in a fresh coconut husk. The pudding had a silky soft texture and was topped with fresh fruits which gave it extra texture and acidity. This dessert is something i wonuld't mind having an extra serving of, and something that i will certainly order the next time i am back at Gim Tim. 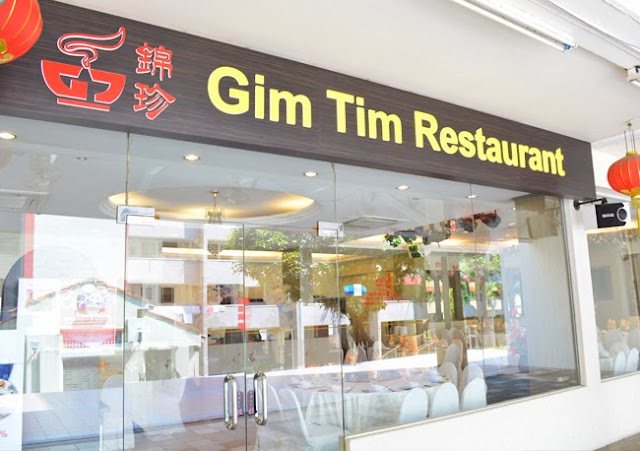 A place that keeps the tradition going, and still serves up food with such quality and standard, Gim Tim is one of the best chinese restaurants around as far as i am concerned. And if you are intending to bring your folks for dinner, i am pretty sure a meal at Gim Tim will leave them with a smile on their face.